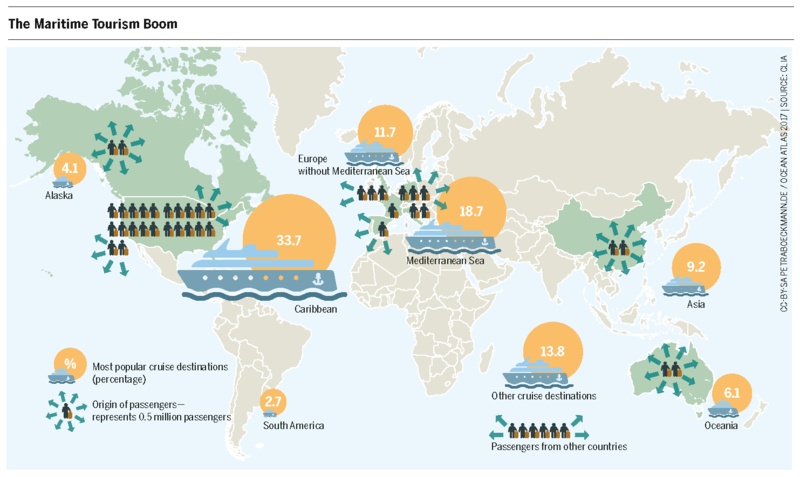 Cruise ships carrying 4,000 travelers, all-inclusive beachfront resorts – increasing global tourism places an ever-greater strain on the ocean and coastal populations. Tourism has become one of the most important economic factors in the world. For some islands and coastal regions, it is actually the number one economic driver. In 2015 nearly 1.2 billion people traveled abroad. And that number is no longer made up only of travelers from North America and Europe. More and more international guests come from Southeast Asia, China, Russia, India, and Brazil. The whole world is looking abroad, and those who can afford to do so take their vacations on foreign shores. The number of those who vacation in their own countries amounts to 5 to 6 billion. As a result, the number of overseas travelers has risen forty-fold since 1950. According to estimates from the World Tourism Organization (UNWTO), the global total may rise to 1.8 billion by 2030. In 2015 608 million people traveled to Europe alone. 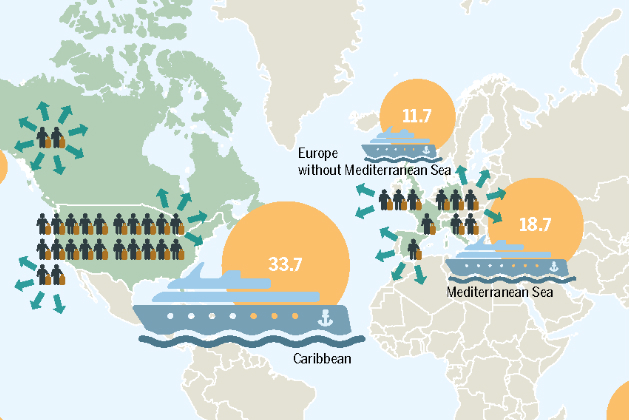 343 million visited the Mediterranean in 2014 alone. That’s around a third of all international travelers. A holiday by the sea – for many people, it is the ideal image of a relaxing vacation. 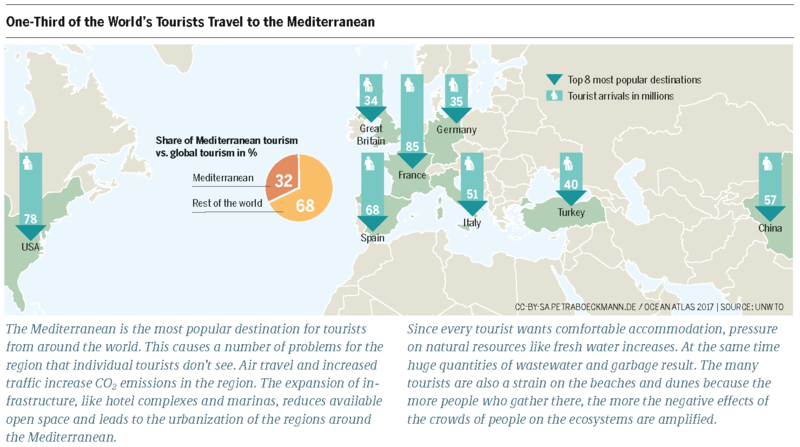 But many tourist hotspots in and near the ocean increasingly suffer from the stress of large-scale tourism. Consider Venice: the city has been a magnet for tourism for 300 years, though for much of that time it only entertained a few well-off travelers at a time. But that changed after the Second Word War. At the time, the city had 200,000 inhabitants. Today just 50,000 remain – and they play host to 30 million travelers each year. Ten cruise ships visit the city’s lagoons each day, all of them traveling more or less directly past Piazza San Marco. Venice is a prime example of the problem of booming tourism: while the number of visitors increases rapidly, the number of desired destinations does not. 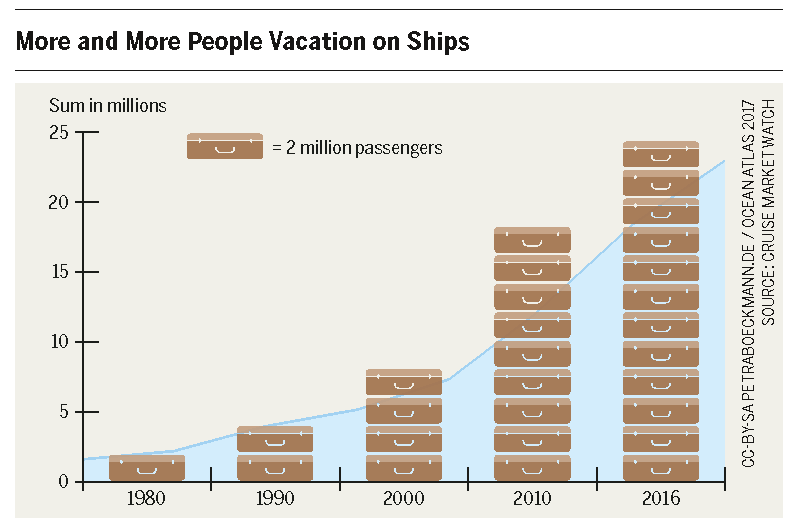 In 1980, 1.4 million people went on cruises. Ten years later that figure had risen to 15 million, and in 2016 CLIA (Cruise Lines International Association) announced 24 million passengers. Many of the world’s coasts have long since reached their tourism capacities – increasing cruise tourism places them under even more pressure. And the cruise ships themselves are growing too: ships with 3,000 to 5,000 passengers plus 2,000 crewmembers are no longer rarities. The pollution produced by these floating cities is just one of the significant problems that tourism destinations must cope with. Resource consumption is another. The many people who want to visit the beautiful beaches, enchanting diving areas, spectacular natural wonders, and romantic cultural sites contribute to high water and energy consumption, increased wastewater production, garbage problems, and the dredging of channels for ever-larger luxury ships. In the long run, those factors will overwhelm many dream destinations. That is because every island and every national park has a natural limit to the number of people it can accept. If it is surpassed, the result is the destruction of the natural resource that attracted the tourists in the first place. And that loss will be followed by the loss of the livelihoods of current and future local populations as well. This risk exists for every type of tourism on the ocean, from exclusive resorts to big concrete hotel complexes to cruise destinations. What has been lacking until now are sustainability-oriented controls of the streams of tourists at the global level. When such controls do exist locally, they are often exceptions to the rule, like on the Jardines de la Reina, a chain of islands belonging to Cuba, in whose waters a maximum of 500 divers are allowed each year. Authorities also reacted strongly in Thailand, closing the island of Koh Tachai, which was popular with vacationers. The reason: environmental damage caused by too many visitors. Such necessary actions lead in turn to the question of fairness in tourism: if the capacity of the destinations is limited, who is allowed to visit? Only those who can afford it? A profound change in tourism demands new thinking on the part of politics as well as among companies and travelers: the strategy that is adopted should not be simply to support tourism but rather to support strategies that enable sustainable, future-proof tourism while also discouraging non-sustainable practices in the industry. The United Nations named 2017 the International Year of Sustainable Tourism for Development. Time will tell how seriously the international community and cities take Agenda 2030 and if they can initiate measures that effectively stem the tide. Controlling the flow of tourism with capacity limits is an effective instrument for ensuring that future generations will also be able to visit dream destinations. Imagining and communicating this reality is the responsibility of each individual government and of the tourism industry as a whole. And tourists themselves have the power to demand sustainable tourism.